Data type - Define the application field type. When the field is defined as a text it accepts letters, numbers and characters. 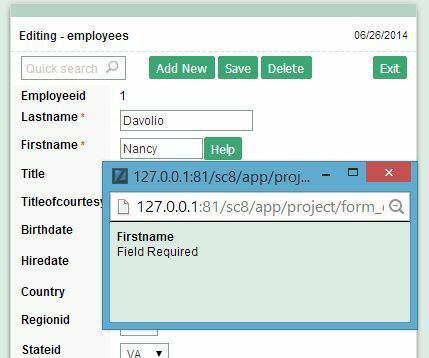 Search Label - Define the application field title. For example: if the field has been defined in the database as nm_name, the agreement is more clearly if the same is simplified to Name. That is because the label is a field nickname in the application layer. Use same Label used on the Grid - This option when enabled, allows you to use the title of the field that is set in the grid, in this case the option filter label can not be used. Maximum Size - Maximum Field Size. SQL Type - Field type in the database. Case Settings - Converts the field letters. Capitulates first word The first letter of first word capitalized. Capitulates all words The first letter of every word capitalized. Submit on OnChange - Allows when activated, to submit the filter when it will have alterations in the field. Show Condition - Allows when activated, to show the filter condition, the same just functions if the filter will have at least one option. Reloads other selection type fields (Select, CheckBox, Radio and DoubleSelect) when the field onChange event occours. For example: a Select field "list of states", and a second one list of cities. It is possible to reload a cities list field by changing the state selected. Defines the CSS values for fields individually. Figure 1: CSS Definition interface. Font - Used to select the font type that will be applied to the application field. Font Size - Used to select the font size that will be applied to the application object. Font Color - Used to select the color to be applied to the font using a color palette. Background color - Used to select the color that applies to the background of the application title using a color palette. Bold - Used to apply bold type to the font. Underlined - Used to apply an underlined type to the font. Border Size - Used to increase the border size of the title. Border Color - Used to select the border color to be applied to the title using a color palette. Horizontal Alignment - Sets the Search form label to the desired location (left, right, center or justify). Vertical Alignment - Sets the Search form label to the desired location (baseline, sub, super, top, text-top, middle, bottom, text-bottom). Width - Sets the title width. Height - Sets the title height. Font Color - Used to select the color that is to be applied to the font using a color palette. Background color - Used to select the color to be applied to the background of the application field using a color palette. Border Size - Used to increase the border size of the field. Border color - Used to select the border color to be applied to the field using a color palette. 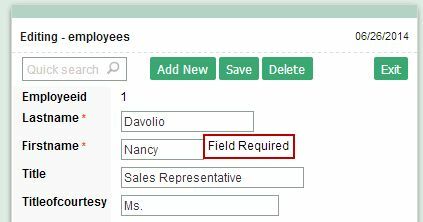 Horizontal Alignment - Sets the Search form field label to the desired location (left, right, center or justify). Vertical Alignment - Sets the Search form field label to the desired location (baseline, sub, super, top, text-top, middle, bottom, text-bottom). Width - Sets the field width. Height - Sets the field height. Font - Used to select the font type that will be applied to the application object. Background color - Used to select the color to be applied to the background of the application object using a color palette. Border Size - Used to increase the border size of the object. Border color - Used to select the border color to be applied to the object using a color palette. 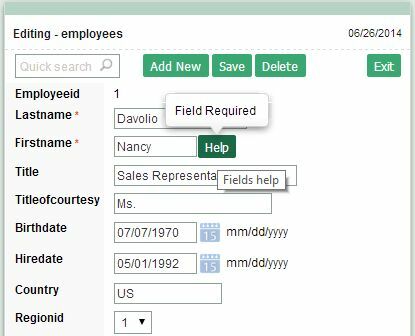 Horizontal Alignment - Sets the Search form object label to the desired location (left, right, center or justify). Vertical Alignment - Sets the Search form object label to the desired location (baseline, sub, super, top, text-top, middle, bottom, text-bottom). Width - Sets the object width. Height - Sets the object height. Documents the application. Create on-line instructions, describe business rules and save comments in the System Help to allow users to better understand the system and instruct them in the best way of interacting with the applications. Figure 1: Help Configuration using a pop-up window. Tooltip - Add text that will be displayed when the user hovers his mouse over the field. Pop-up - Displays the help text in a pop-up window when the help icon displayed beside the field is clicked. Hint - Displays the help text in a hint window when the mouse cursor hovers over the field. Text - Display the specified help text beside the field.